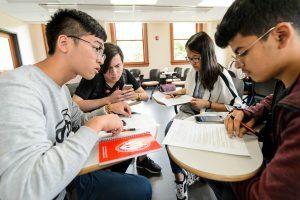 There are four distinct subject area programs within the UW-Madison secondary education teacher certification program: English, Mathematics, Science, and Social Studies. Students apply to and are admitted to one of these areas. Students from all four areas go through the program as a cohort, taking classes and participating in field experiences in cross-curricular groups. Methods instruction and student teaching experiences are specialized within the content area. Teaching and learning about English as a Second Language is infused throughout the program. Questions about the ESL elements of the program can be directed to the ESL coordinator listed below. The English program is designed for individuals intending to teach English and Language Arts subjects at the secondary level. This might include various kinds of courses in literature, writing, grammar, and drama. The Social Studies program is designed for individuals intending to teach social studies subjects at the secondary level. These include middle and high school subjects such as general social studies, history, sociology, psychology, political science, geography, and economics. The Science program is designed for individuals intending to teach science subjects at the secondary level. These include middle and high school subjects such as general science, biology, biotechnology, chemistry, physics, environmental science, and earth and space science. The Mathematics program is designed for individuals intending to teach subjects in mathematics at the secondary level. Typical subjects include general math, algebra, geometry, algebra II/trigonometry, pre-calculus, and calculus. Throughout the program, individuals will work closely with students whose native language is not English. These students, often immigrants from a wide variety of backgrounds and experiences, have specific needs and encounter unique challenges in mainstream English-language high schools and middle schools that our program is designed to address. All those who complete the secondary education degree program successfully will be certified in their subject-area specialization and in ESL. The ESL certification is in high demand across the country’s schools.